The Home Made Simple coupon book is back again. You’ll get $35 in coupon savings on select P&G brands when you request the Home Made Simple Coupon Book. 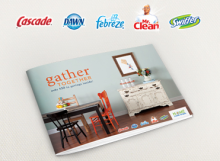 This is a great coupon booklet filled with brands like Cascade, Febreze, Mr. Clean, Swiffer and more. P&G brandSAMPLER’S coupon booklet is back! P&G brandSAMPLER’s is back! This is one of the best coupon booklets out there! Today at 9am PST, you’ll be able to register for this coupon booklet. Some of the coupons included are for Head & Shoulders®, Always® & Prilosec OTC® â€“ while supplies last! Don’t miss out! You can find out more about this offer on the P&G Facebook page. Coupons Aug 1, 2011 in PandG · Expired! This is one giveaway that will save you a ton of money! Head over to Facebook and “Like” P&G Everyday Solutions. They are having a giveaway this morning and I’ve heard it’s a coupon book that is values at $110 in coupons! Coupons Feb 7, 2011 in Facebook, PandG · Expired! P&G eSaver has released some more new high value eCoupons that can be added right to your shoppers card! This is a new feature that makes it easy to use their coupons! You can get more then $80 in coupons added right to your card. This offer is good through June 30th. Coupons May 4, 2010 in PandG · Expired!